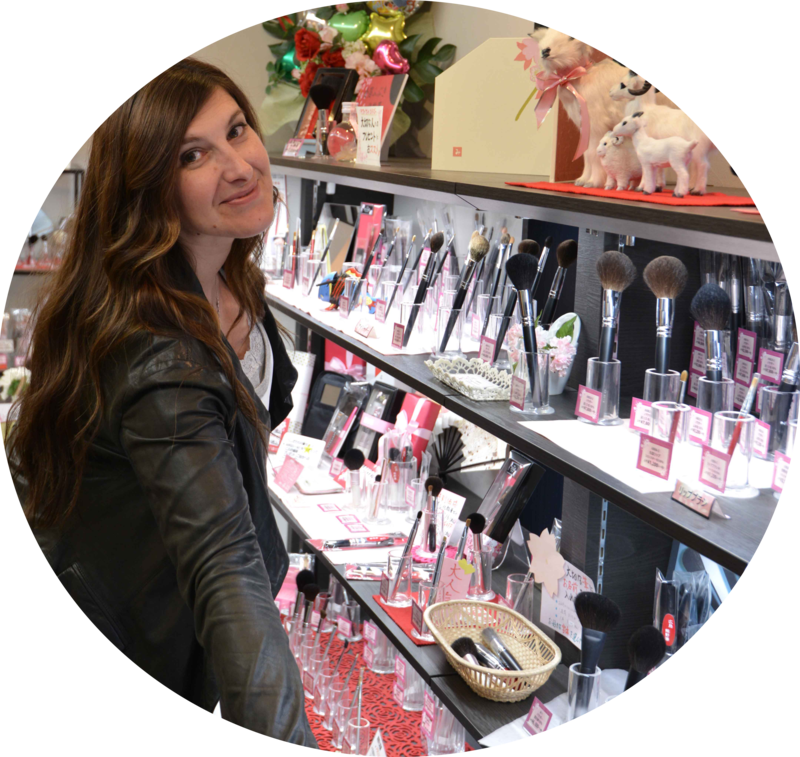 This wonder brush falls into the category of : “BWB” = Brush With Benefits. Let’s start with the details of the brush, then we can speak of those benefits. It is delivered in a cardboard box with a little velvet pouch, personally I don’t like little pouches like this for fan brushes because to take the brush out, you might need to pull it by the bristles and even if you push it out, the sides will be trapped in the pouch, I am just being very picky here but since there are pouches that open both sides to avoid that issue, I may recommend you to use the ones that will definitely not damage the hair. 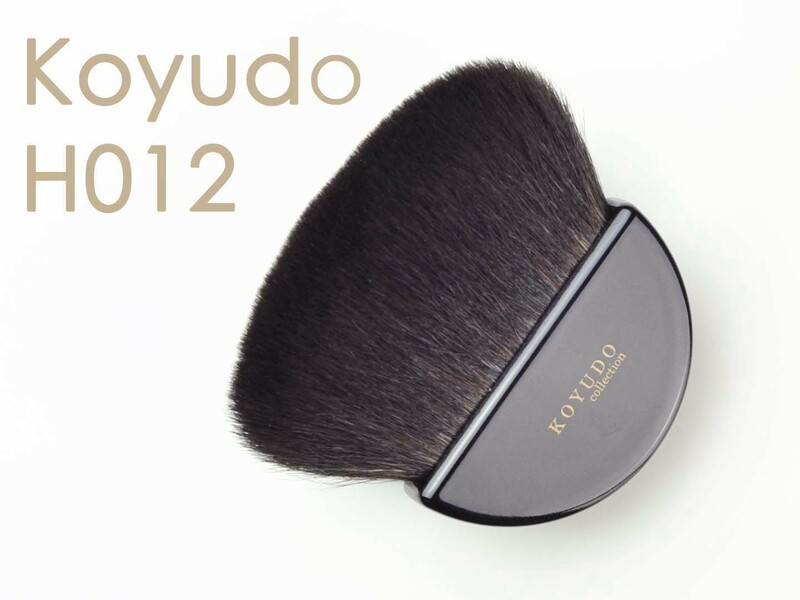 The Koyudo H012 is not a tapered fan brush like the Hakuhodo Fan Black, it’s very thick and it spreads out, the width of the surface is 7cmx2cm, therefore you will not get precision but a medium coverage and a diffused application. 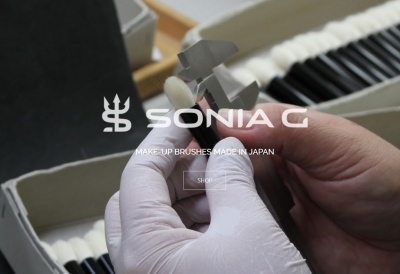 The problem with the online shops is that it doesn’t show a picture of the brush as we want and need to see it, a flat two dimensional picture is often not enough to convince a customer. We want to see how much it’s tapered and how much it covers. 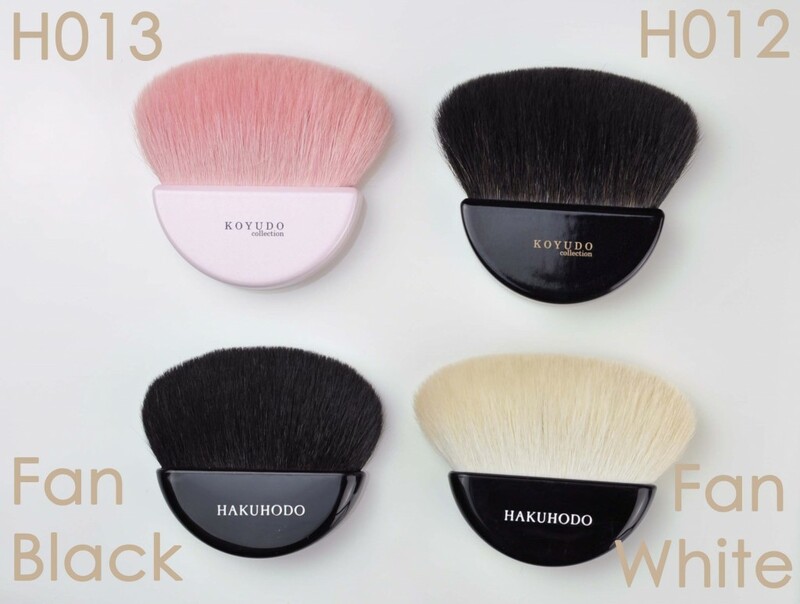 The shape of the brush is similar to the Hakuhodo white fan and the Koyudo H013, the big difference is in the flexibility of the bristles, the white and pink fans are goat and are more firm and directional, they will also blend with more power. 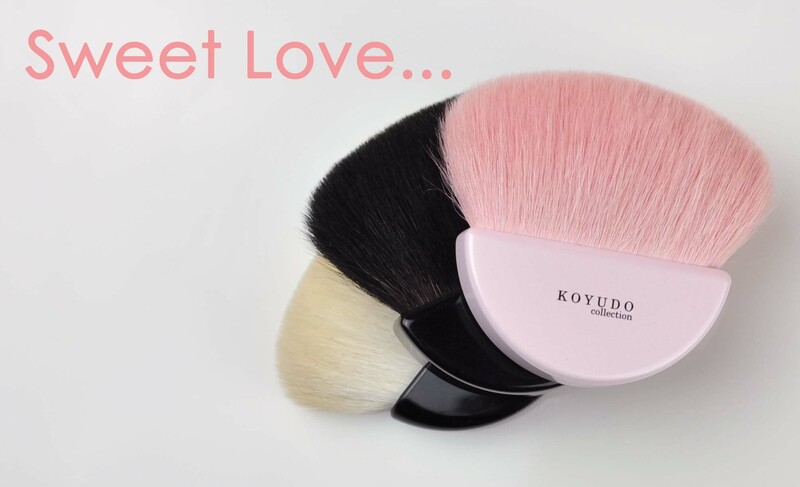 I am brainless when it comes to choosing a brush, when I love a shape I will collect them all – which is NOT a good idea. 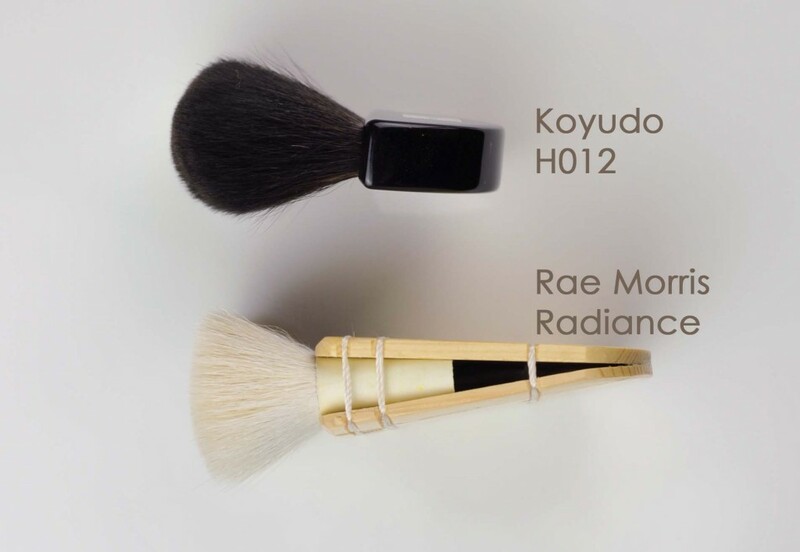 Since it has no dye, the white fan is more appropriate for cream or liquid products, it’s less prone to get damaged by the ingredients, but before you ask, the answer is “no, it cannot replace the Rae Morris Radiance”. There is an amount of pressure you can put in these bristles and if you use the right pressure in my opinion this fan can blend powder but realistically not cream. The pink is just cute as hell (or heaven? ), it’s goat, soft goat hair, similar softness as the white fan actually. 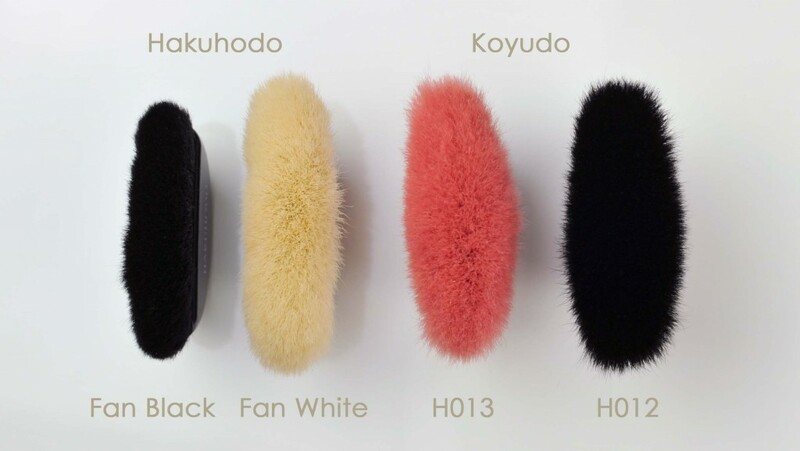 The Hakuhodo Black fan is blue squirrel and goat, it will deliver a precision that others don’t have but personally I get more use of a fluffy fan brush. If you don’t like fans, you will find this little review a tad boring :D… it won’t get any better further down. It terms of usage, it feels weird at first because it’s so wide you’ll have the impression of painting a wall. The application of bronzer is beautiful, enough diffused and enough precise for me, spot on. For blush, for me it’s working perfectly fine because of the way I tend to wear blush, I apply it more in a very wide and diffused stripe versus a centred application in the middle of cheeks. You can use it in several directions, obviously not in circular motions, although it is possible it’s not its strength, but you can use the surface to place and work the product into the skin or the sides to brush it away. Yeah, sane people can just stop reading here please or they will think I just went psychotic. You hold it, you use it : You have a feeling of fullness that is extremely comforting and pleasant. A full-face massage that will make you feel immediate satisfaction. Just for that therapy I think it’s worth it. We all are different and we all prefer different type of brushes, I very much love when the pressure of the surface of the brush is the same from left to right (a flatish shape if that makes sense), it’s also probably why my favorite shape of blush brush is also round and flat. Not saying that tapered brushes are not good, they are good indeed, just feeling that some shapes are more therapeutic to use than others…. Koyudo H012 was last modified: September 24th, 2014 by Sonia G.
Thank you for yet another great post. You made me smile (cause I always have a big like for people with passion, especially when it considers the real important things in life, like brushes & bristles). Furthermore I am in awe as to how much you know about this subject. Gives me a diff look on my own, meagre, brush collection. Please, keep up your good work, you’re doing me (and many others I gather) a huge favour. Yes sometimes i hold one squirrel brush in each hand and stroke my face… HEAVEN ! Oh I remember hoping the white goat Hakuhodo would work like a mini Radiance! 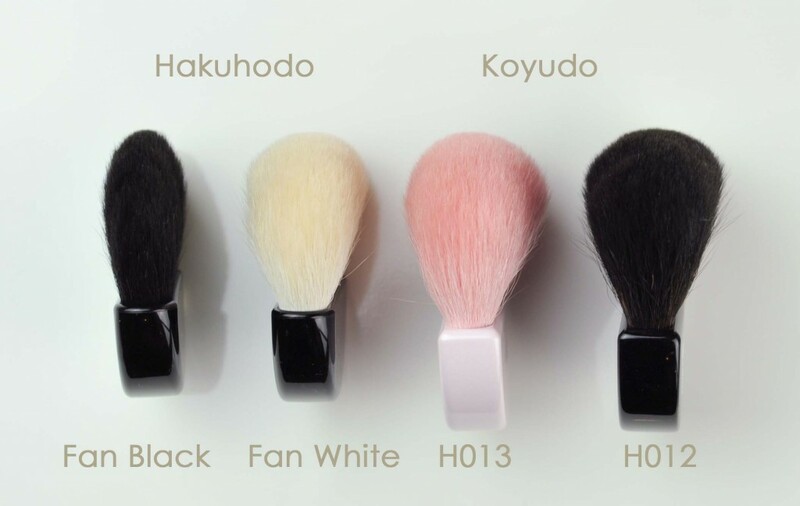 But wait, what if you took the white goat Hakuhodo and tied it to the pink Koyudo to make a double fan brush, maybe THEN it would be thick and firm enough to replicate the effect of the Rae :D??? And looool at brushes in stereo! I want to do that :D!!! Stereo is the way to go!!! Next, surround sound ;). You’re going to need additional pairs of hands for that :D! You have crazy obsession for fan brush. I have always wondered about the the difference of performance of fans in various size (why are there so many?) and lost my confidence in any one of them, now we have a true analysis to see why. Thx Sonia. I just wonder, some day, people would make close-up silent video of using individual brushes (esp. for shapes as unique as these) to show how to pick up color product and the surface (&angle) the brushes are designed to hit our face. Chikuhodo has done few, it’s a good start. But Chiku isn’t a brand for shape diversity. that is really very useful indeed, I love when they do that!! I have pored over this post at least five times. 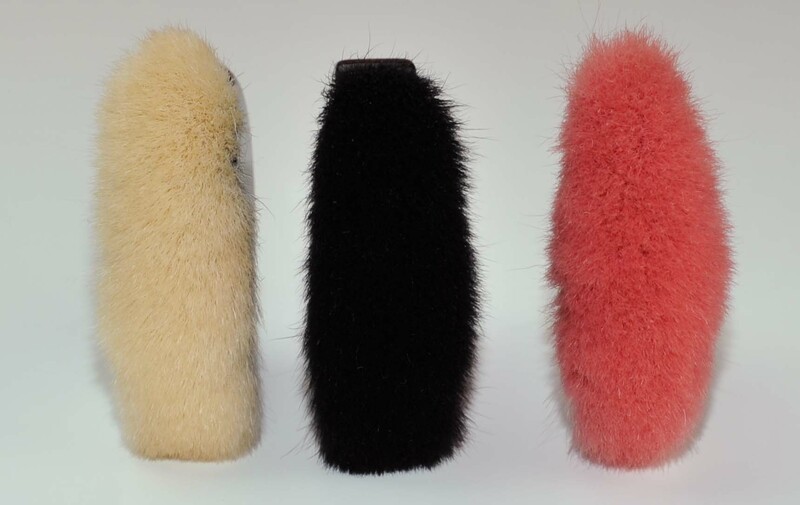 I adore fan brushes and one of these babies will be mine some day. I’m just trying to figure out which brushes (face & eye) to choose so I can minimize shipping fees. As usual fantastic post! 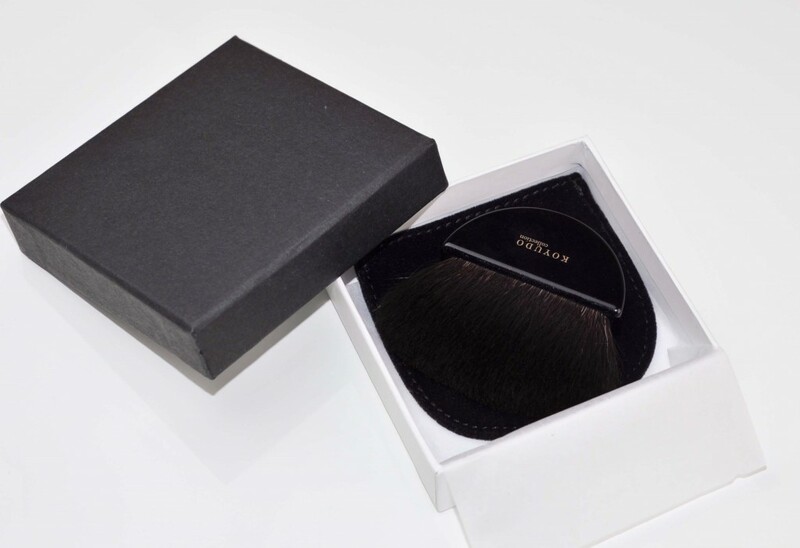 I have the Hakuhodo fan brush and “he” just sits there is his lonely box waiting to be used. I have such a hard time with fan brushes. I think my hands are too big to really grasp the base properly. 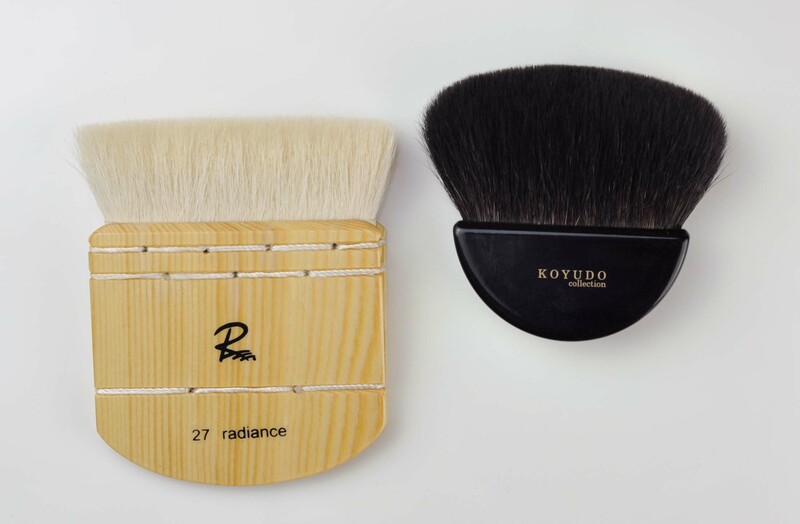 I may have to take a look at the Radiance Brush…But no wait…Wayne is coming out with his new brush on Dec. 12th…looks like a larger version of his Brush 02 (which I just reviewed and loved). I may get that, then the Radiance?…oh boy…so many brushes, so little finances 🙂 demasiadas opciones. The very best to you Sonia.